This custom-inspired workhorse snare is perfect for live or studio applications. 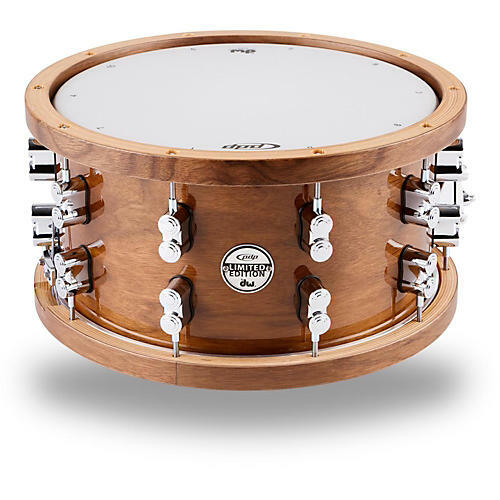 This PDP Limited Edition Maple/Walnut Snare offers warm, musical tone, custom features and a traditional appearance. The shell features 10 plies of maple enveloped with a beautiful walnut veneer. Matching wood counter hoop provides a round, full rimshot. Also, this drum is fitted with unique Dual-Turret Lugs, a DW MAG throw-off and copper snare wires. Fitted with DW heads by Remo, this snare is ready to play out of the box. Snare size: 14" x 7-1/2"